I have no idea why we decided to name this drink a Mojito-rito. But for some reason, it just happened. My first thought is maybe because it’s somewhere between a mojito and a blended margarita… but I’m not sure if that is really why we came up with it or not. Either way, this drink was a creation that was basically the result of bringing home a bottle of rum and realizing we had no mixers. At all. I had bought a big ol’ bunch of mint at the farmer’s market and was dreaming of making mojitos with some of it. So, graciously, my boyfriend Brett went out and bought some white rum to bring back to me. Club soda, he forgot. So we improvised. It turned out to be the most delicious improvisation we’ve made yet. Seriously, not only does blending mint turn your ‘mojito’ into the most fabulous shade of green, but it makes something so refreshing that it turns an ordinary Sunday afternoon into a mini vacation. It’s not too sweet, it’s just strong enough that you don’t forget what it is you’re drinking, and, people, look at how green it is! Brett even went so far as to say it was his favorite cocktail he’s ever had. So if that doesn’t convince you, well gee, I just don’t know what will. You can tell it’s delicious (and has rum!) by how happy I am! Get out two party cups (or tall cups), and fill each one about 2/3- 3/4 of the way full with ice. Pour 1 1/2 oz of rum into each cup, and then squeeze the juice of a half a lime into each. top with 1/2 handful of fresh mint and 1 tbsp of sugar. Pop on your cross blade and blend until you don’t hear big chunks of ice whirling around anymore. Pour into a glass (or just screw on the party cup lid if you prefer), top with a sprig of fresh mint, and enjoy! In your hour of need, I come to you with an amazing smoothie recipe! Yesterday morning, before embarking on a vigorous hike, I decided to make a fruity concoction to get myself energized and motivated. For the smoothie, I used some of my favorite fruits and even added a little raspberry sorbet, because I was feeling just that crazy. This is a picture of me on a hike. Stretching my limbs or really exhausted? You be the judge. * Just a note– this smoothie is on the thicker side and fruit heavy. Feel free to add more orange juice for a frothier version. Cut strawberries into halves and cut mango into small cubes. *Cutting a fresh mango can be challenging. If you’re not up for the task, you can always get pre-cut mango at your local grocery store. 2. 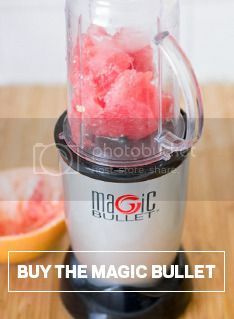 Add to tall cup, ¼ cup scoopable raspberry sorbet, ½ cup blueberries, ½ cup chopped ripe strawberries, ½ cup fresh cut mango and ¼ cup orange juice. 4. Drink your smoothie and go take a hike. Get out of here! I mean it! This smoothie, jam-packed with fresh fruit, really helped me power through my hike. I felt like such a professional up in those hills. The next time I decide to take a nice long hike, I will definitely be making myself this drink. Hope you enjoy! You may have noted from my bio that I’m extremely fond of tropical fruit smoothies. Well, the rumors are true! Although my obsession with blended fruit beverages is a fairly recent development, I can’t imagine how I ever lived without them. I must have been so depressed. Please prepare yourself by putting on your favorite Hawaiian shirt. Wow, you look great! That shirt really brings out the color of your eyes and I’m not just saying that. Guess what? Now you’re ready to make your very own Coconut What? smoothie. To tall cup, add ¾ cup of fresh pineapple chunks, ¼ cup unsweetened coconut milk, ½ banana, 3-4 ice cubes and 1 teaspoon of honey. *Make sure to add the honey last so it doesn’t stick to the bottom of your tall cup. At this point, you might be wondering why I have listed 2 leaves of fresh basil. Well, during one of my first attempts at making this smoothie, I realized that I had used too much coconut milk. While the smoothie’s texture was perfect, it had a weird coconut milk after taste. If you find yourself in a similar situation, don’t fret! And don’t throw your smoothie out just yet! Try adding 2 fresh basil leaves into your tall cup with the finished product and blend until leaves are fully incorporated or appear as little green specks. The basil leaves really help to cut down the flavor of the coconut milk and also, add a nice fresh flavor to your smoothie. I hope you enjoy making this smoothie and feel as though you’ve been transported to a dreamy Hawaiian island! So I’ve mentioned how much I like smoothies for breakfast. But generally, a smoothie alone just doesn’t quite cut it. Sure, it makes a nice dent, but it isn’t going to be enough to keep you full until lunch. This is where the genius of the bowl comes in. You’ve seen them. C’mon now, don’t be shy. You’ve walked past the hippe “health bar” where the guy with dreds flashes you a peace sign as he digs in to something purple and drippy and covered in fruit. You think, “Man, that looks good.” So you’ve even gone in. You’ve looked at the menu. You know it’s covered in organic granola, bananas and, wait.. bee pollen? Then you’ve seen the price tag. “Eleven dollars?!? For a bowl of smoothie? !” And you’ve walked away. Or maybe you’ve forked out the cash and you didn’t exactly regret it because yeah, it was downright tasty, but you’ve certainly mentally scolded yourself for spending so much on something that melts. Hey everyone! Erin here. Smoothies are, well, delicious. They also happen to be nutritious, or at least, they can be. Sure, Juice it up has the best white peach smoothie I’ve ever had in my life. But that’s because it’s made with ice cream. Duh. And even though we’re “grown ups” now and we technically can eat ice cream for breakfast, because y’know what, ma, I do what I want! ahem. We really have become our parents and “know better now” or at least, have to make it through 8 to 12 to 14 hour work days (plus school and studying and oi vey), so ice cream generally isn’t going to cut it for breakfast. But smoothies still can. Especially when paired with something like an english muffin or an egg-inside-tortilla, which is my personal favorite thing to pair a smoothie or juice with. And smoothies actually can do a very good job of not only keeping you a bit fuller and keeping your energy up, but you can sneak in a whole bunch of good stuff that you otherwise might not want to eat all that much. Which is what we do. Green powder, which I’m pretty sure you can buy anywhere they sell strange health-food items, is one of my boyfriend’s obsessions and we put a couple scoops in every smoothie we make. And I don’t even complain because I can’t taste it. But the nutrition label says I am being nice to my body when I eat it. go fig. Serious noms, in your inbox and on your phone, wherever you are. It's so deliciously easy. The information provided on this site is for informational purposes only. It is not intended to nor should it be a substitute for advice, consultation or visits to your health care provider.